It will come as no surprise to regular readers (I do like to dream) that I am something of a junkie. But lest you think I use the term junkie in reference to my pharmaceutical day job, let me quickly clarify: I am an Oreo junkie. If you will allow me to be even more specific, I’m not talking about the kind of junkie that always has to have Oreos around the house, and inhales them one bag after another. Rather, my obsession is more about the drive-by’s through the Oreo section of the grocery store cookie department on practically every visit, looking for new varieties – even if I’ve just run in for a jug of milk. (Especially if it’s just for a jug of milk, come to think of it.) To be fair, I also find myself in the freezer section to see what new, wild consortium of chunks and swirls Ben and Jerry have dreamed up since my last visit. And I will often swing the shopping-cart through the yogurt section because I prefer unusual yogurt flavors. The difference, however, between Oreos and…well…everything else, is that I almost always buy the new Oreo. There is a certain percentage of purist in me that needs to state that no wild Oreo variation beats the original chocolate cookie with the white filling. That is indeed the standard by which all others are measured. And I will go further and say that the chocolate cookies are a notch higher than the golden versions, but let’s not get too crazy and throw the baby out with the bath water. The golden cookie may not have the eternal qualities of the original, but it’s still a doggone good cookie. So I check them, too. It doesn’t matter if I’m on a diet. I will save them in a secret place until I fall off the wagon. (A fall which can be predicated by hiding them poorly from myself.) It doesn’t matter if I’m short on cash. The milk can wait. These are limited editions, for goodness sake, and if I put it off I might very well miss my shot. The diet can start again tomorrow, and if I have checks I have money, right? Let’s narrow down this obsession a bit further. Unlike the holiday shapes of Reese’s cups, I don’t spend money on an Oreo shaped like a football. Pretty much the same cookie to crème ratio, so there’s no point. And the colors? Second verse, same as the first. Winter red, Halloween orange, and Spring yellow might be pretty at parties but that’s about all the advantage they have, and it’s not much. Ditto for the cute patterns and designs on the cookie proper – aesthetic value only. What I’m looking for are completely new taste experiences, which usually manifest in the form of creative crèmes. One of my favorites is the Peppermint Holiday – chocolate cookie with bits of crushed peppermint in the crème. If I weighed a lot less, I could eat my weight in those. I dearly love the white-fudge-covered ones that also come out around Christmas. (And if I don’t see them, I make them at home.) The only downside is that every season there seem to be fewer and fewer cookies in the box. (Does this mean the Girl Scouts are involved? Hmmm.) Aside from those, I’ll try just about any flavor at least once (except coconut – don’t be silly). As I am wont to do when I go on one of these rants, I do have one beef that must be aired. I was in a local store a few weeks ago and saw a pack of Oreos for sale at the cash register. Upon more careful scrutiny, I discovered it was not just a plain Oreo, it was “cookies and crème” flavored. Take a breath here, because I’m serious. The quintessential combination of cookie and creme, essentially unchanged since its inception over one hundred years ago, and both the inspiration for and crucial ingredient of “cookies and crème” ice cream, now comes flavored as itself. Can you imagine cake-flavored cake? I almost went against my nature and refused to buy it on principle. But the urge was too strong. 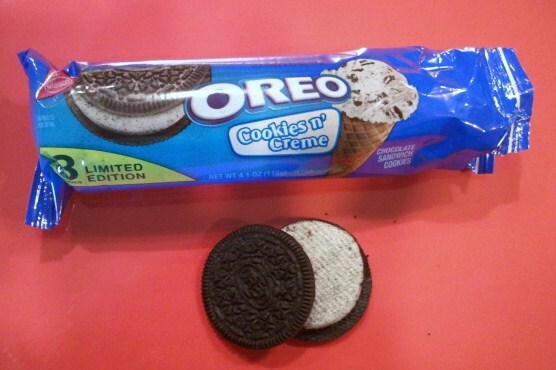 I just had to know what an Oreo-flavored Oreo was all about. Guess what? (Don’t get ahead of me here…) It tasted like an Oreo. Shocker. While I’m complaining, I’d like to know why we don’t get all the flavors at our local stores. I thought it would be great to have an orange-flavored cream, since chocolate and orange are a classic flavor combination. I looked it up and sure enough, somewhere in the world there is a Creamsicle-flavored Oreo. Ditto for Dulce de Leche, Dairy Queen Blizzard crème, and Golden candy corn. There are even organic Oreos. Just not within 20 miles of 39759, if the search function on the Oreo website is to be trusted. If the Oreo people are reading this, I have another suggestion or two. How about a Mocha Oreo? Coffee-flavored crème with chocolate cookies would be a very nice combo. I am also a fan of raspberry and chocolate together. Strawberry has been done – let’s move on. Or maybe a ground-breaking crossover: hazelnut crème in partnership with Nutella. But if this is too much to ask, I would be happy enough to find the flavors that have already been created. If Starkville has a shot at Gigabit Internet, surely we can get a Creamsicle Oreo to celebrate. I am what you might call an avid reader. I always have at least one book going and I try to divide my reading time between different genres of literature. Some genres are easier to read than others – for example, a John Grisham novel in progress will be picked up during any free moment (and I use that term loosely) until it’s done. On the other hand, the books on drug interactions or business leadership, as important as they may be, take much longer to plow through. It may be, however, that the printed media which presents me the most difficulty is the restaurant menu. Allow me to provide a little context. Suppose you are seated at your favorite Mexican restaurant. You are handed a menu which in weight and square footage is second only to the oversized coffee table book on the art of the Louvre that you picked up in France, the same one for which you had to pay an extra baggage fee just to get it back home. In order to open it fully, the person next to you has to scoot over or duck. Why? Because menus at Mexican restaurants are long. Mucho long. This is why, in my opinion, the menu items are generally given numbers. It’s just easier for our amigos in the back. Ditto for many Chinese restaurants: long and carefully enumerated menus and the buffet to boot. When these extra-large menus are handed to me, they sometimes create a moment of anxiety. Though I am a big proponent of variety, having two-hundred choices is a bit overwhelming. I may make fun of The Wife for automatically ordering chicken fajitas at any restaurant where chips and salsa are put on the table before the server arrives, but I have my limits, too. I want enough choices to be able to have a different dining experience each time I go to that restaurant if I so choose, but I don’t want to have to spend fifteen minutes reading the menu. The other extreme is the miniscule menu. Last week we were in Tupelo and ate at a little place called The Neon Pig. Believe it or not, it is not a barbecue joint. I found it via yelp.com and saw a lot of great reviews on something called a Smash Burger. 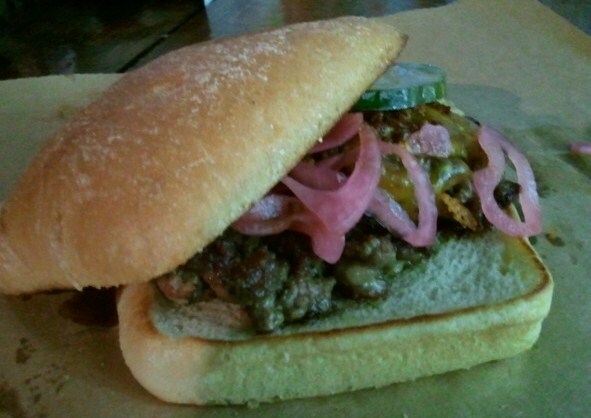 My attention has been turned to burgers of late and it sounded like a good opportunity to broaden my burger horizons. Plus, someone mentioned they’d eaten a fish taco of some sort, so that was enough. Had me at hello, so to speak. My plan for the three of us (Daughter was not on the journey and Son is generally willing to accept my assistance in ordering) was to get a Smash Burger, fish tacos, and something-else-to-be-named later. Named by me, of course. We arrived and the menu was tiny. (So was the restaurant.) There are essentially ten items to choose from. Ten. One salad. Two burgers. Three sandwiches (three different meats.) Then three more sandwiches under another heading. One dessert: cake. And that was it, save one daily special and two options for the “piglets”. It took about a minute to read. I also discovered in that minute of reading that the fish tacos were not to be found, thus must have been a daily special at some point. We got our own drinks from the cooler (Abita root beer for me) and picked our own chips off the rack (a half dozen flavors of Zapp’s.) And we all ended up ordering burgers. Simple. The downside is the answer to this question: how many times could I go there before I ran out of things to order? Not many. The upside? 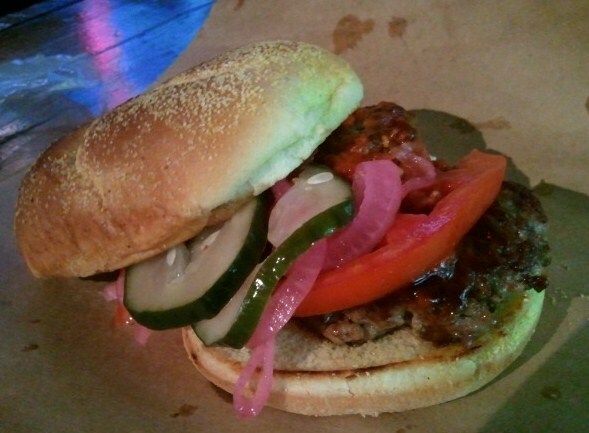 The burgers (we got a Smash and a Bash) were fantastic – definitely worth having again. Another menu-related challenge has to do with those items not on the menu at all, sometimes known as the daily special. I always want to hear the specials. And more often than not, I give them a try. Who knows? It might be some fantabulous combination of flavors and textures that may never again be repeated – and what if I missed it because I ordered something off the menu that will still be there the next time I go? It’s not a foolproof plan – specials can be risky, and I have made choices that made me covet The Wife’s chicken fajitas – but it works enough to keep trying. There is another category of off-the-menu items as well. They’re not necessarily daily specials, but they are back there in the kitchen, waiting to be requested. 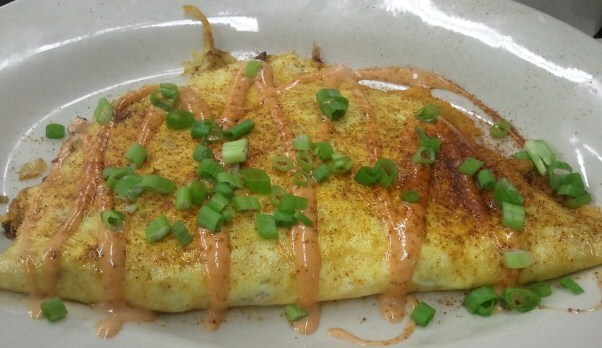 Like the time a couple of years ago when I was at the Starkville Café for breakfast and said, “Hey, do you think I could have an omelet with barbecue in it?” The answer was yes, and I have requested it a time or two since. Still not on the menu, but still available for the asking. And still my favorite breakfast at the Café. I have said it a bazillion times. You have not because you ask not. Menu has more pages than the Affordable Healthcare Act? Already carefully chose from the online menu then they tempt you with a one-time seasonal special? The rhyming of Smash Burger and Bash Burger throwing off your decision-making? Ask your favorite restaurant guide site to show you the reviews. Ask the server to share his or her favorite item. Ask The Spouse and Kids to order the other things you want and pass them around. Just ask. And enjoy it all. This week a buddy asked me where I liked to eat in New Orleans. I had to think for a minute because my last visit was pre-Katrina. It’s not because I don’t love to eat there, I just haven’t been able to arrange a trip in a while. What’s even worse? Since I really began paying attention to the food world a few years ago, I have come to learn so much about so many iconic New Orleans restaurants that I feel like I know them – I’ve just never tasted the food. That’s a little bit like how I felt about Meridian until I went to the Eat Drink Meridian event a few weeks ago. Before I set foot in the Northeast Conference Center and began salivating at the sights and smells before me, I had already heard of several of the vendors from the metro area. Spoonfudge!, which was included in my first report of the event, had been featured in one of my favorite culinary magazines. Weidmann’s, from part two in this series, is a place almost always mentioned when Meridian’s culture is discussed. Now I had everybody in the same room. Cha-ching! 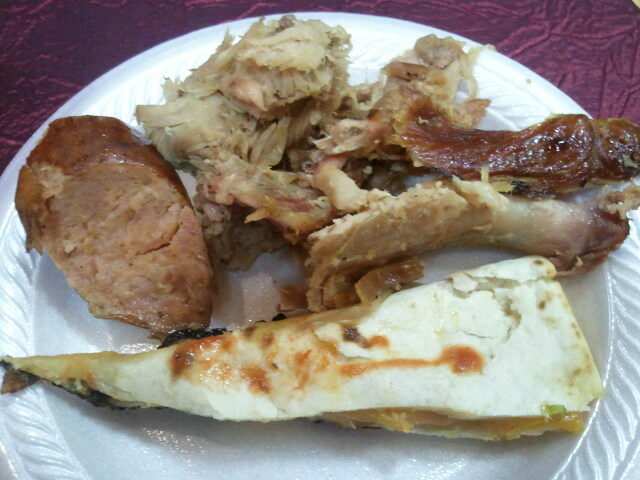 The other Meridian establishment I had been trying to get to for a long time was Squealer’s Bar-B-Que. Not so many months ago I was still traveling to work a good bit and passed the time listening to podcasts. The Southern Foodways Alliance has a vast library of oral histories that can be downloaded, and the owner of Squealer’s Bar-B-Que had been featured in one of them. In the interview, she expounded on her philosophy of barbecue which in a nutshell is: it’s about the meat. Sauce is served on the side to enhance the smoky flavor of the meat, not to cover it up. They also had my heart (in more ways than one) on the dessert selections offered at the restaurant: fried Twinkies with all kinds of toppings and a fried banana pudding. O’Charley’s was there pushing pie. Peach, apple and pecan were our options. The peach was pretty good, but the most popular (per my query of Mr. O’Charley’s representatives) – Ooey Gooey Caramel – was left at home that night due to lack of refrigeration. I might need to find one of those later. 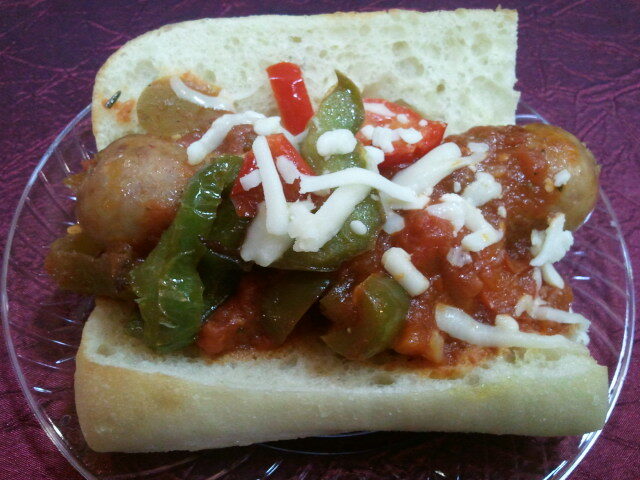 Also representing the chain restaurants was Olive Garden, with a sausage and peppers sandwich. I confess I wasn’t expecting much out of this sandwich, but the worst thing about it was the size: too big to finish. It was like a pizza sandwich with power – all the flavor and elements of a sausage supreme pizza on good bread. A bit messy, but worth it. In the appetizer category the ladies from Sarabella’s Southern Sauces came to show off their “sinfully delicious, sassy, and divinely Southern” concoctions. They offer Wicked Sweet Chutney (a pineapple based recipe with mustard and horseradish), Sassy Raspberry and Magnolia Basil-Mint. My favorite was the Wicked Sweet, which they suggest serving with ham and biscuits, as a dipping sauce for all kinds of meats, or just poured over a block of cream cheese. Versatile in use and an interesting variety of flavors. Fun stuff. Last but not least was the Hilton Garden Inn of Meridian (which happened to share the same parking lot as the conference center) with pulled pork sliders and hot wings. 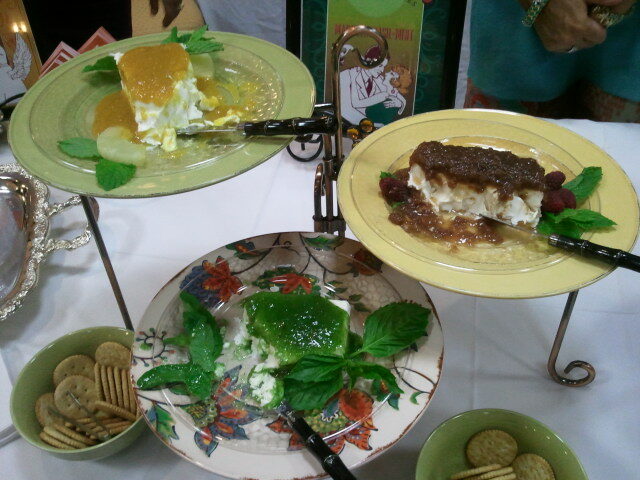 What I found particularly interesting about these dishes was the presentation. The sliders had a baby whole pickle speared to the top bun and the hot wing appeared to be sitting precariously (save its own spear) on top of a divided cup with ranch dressing in one side, celery and carrots in the other. On the plus side, the hot wing was flavorful, but not too hot – just the way I like them. There are a lot of perks to attending events like this. The food is a gimme’. When there are bragging rights on the line, everybody puts their best food forward. Having it all in one contained space practically within reaching distance just makes life better. Along those same lines is the opportunity to experience a new normal of sorts. I love the fact that my hometown is evermore booming with a continually expanding variety of eat-out options. I also appreciate that I can drive just a ways down the highway (or stop there on the way to somewhere else) and open up my world to a completely different set of culinary surprises. The best part, however, may be the people I meet along the way. Before I went to Eat Drink Meridian I could say with certainty that I knew one family living there. Now I know lots of folks from Meridian on down I-20 to Forest, up Highway 21 to Sebastopol, and back. They were fascinating to visit with and by golly, they can cook.